I was watching that race and saw the filly suddenly start bucking while backing up through the field. It's too bad that she apparently kept trying to run after dumping her rider...that inevitably causes more damage to an injured leg. Really sad news about Violette, he was a helluva horseman. May he RIP Condolences to his family and friends. Unfortunately, Paddy O'Prado's final crop of North American foals of 2018 will be his last. The son of El Prado died in a paddock accident prior to this year's breeding season and never got the chance to a cover a mare at Evicmen Harasi, according to an officer with the Jockey Club of Turkey. Oh no. He was one of my favorite sons of the great sire El Prado. And getting this news SO long after his death is one of the reasons why I'm never happy to see stallions sold to places like Turkey or Korea. Just too hard to keep an eye on them. May he rest in peace and green pastures. What a lovely obit. I had to chuckle a bit at this part. A big powerful colt that matured early, his tough constitution and robust attitude to life has seen him outlive the other members of the 'big four', Filante checking out in 2008, while Saintly and Octagonal departed in 2016… he always was the best stayer! Nothin' Leica Dane will be fondly remembered by all who knew him and is survived by his best friend Sir Laurence, who is still going at the amazing age of 32! The grandfather of racing partnerships. Rest well, Mr. Campbell, you won't be forgotten. Cot Campbell, founder of Dogwood Stable, passed away Saturday afternoon at his home in Aiken, South Carolina. He was 90. Campbell was a pioneer in racing partnerships and Dogwood runners included Classic winners Palace Malice, winner of the 2013 GI Belmont S., and 1990 GI Preakness S. winner Summer Squall. 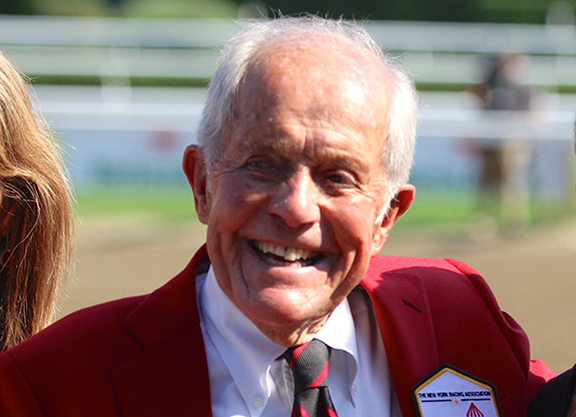 Campbell was inducted into the Hall of Fame at the National Museum of Racing in August. Very sorry to hear this news about Mr. Campbell, but what a wonderful and long life. His place in the racing pantheon is secure. I would recommend to all of those who have not read his books to pick them up if you have the chance. I found his writing to be some of the best in the equine book realm. Captivating - just like the grand gentleman himself. Rest easy indeed, Mr. Campbell. I've read all his books and completely agree, funny ones too. There're lots of tribute articles about him out there now, but somehow this one written by Joe Clancy in August 2013 before Palace Malice won the Belmont just seemed to capture what I remember most about him. Warning - take Joe's advice. I wrote it for this month's Mid-Atlantic Thoroughbred, and it started as a simple idea: "See if you can get Cot Campbell to talk about what he was feeling after the Kentucky Derby, but before the Belmont. Ask him what Mike Freeman would have told him, what all those guys back home in Aiken would have told him." I talked it over with Sean, hatched a plan, then made the call. Campbell listened, thought a beat, then said "I'll get back to you." We missed each other a few times and just when I thought the story idea would sink, he called back with some notes. The rest twisted and turned afterward - with some background from Dogwood Stable's Jack Sadler - and wound up with what you see below. Put on your old-school racing hat, suspend your disbelief and let it sink in a little. Thanks Mr. Campbell. ~ Passed away back in May. I hope her foal survived. Oops should have mentioned it did a grey filly by Snitzel. God bless the broodmares. Rest easy, Set Them Free.